So, you know how I'm a shameless wench when it comes to comments, right? I mean, I think it's the endless, slogging quest of any type of artist to elicit a reaction out of people. And that's how I'm going to tangentially relate this post to my blog. Basically, I've installed a comment system called Disqus. You may have seen this on other blogs you visit. You can like or dislike the post, similar to Facebook, and you can reply directly to a comment and I can even respond to what you say via email. The only thing is, you'll have to do a quick log-in through Yahoo, Twitter, Disqus, Facebook, etc. If you want do just do a flyby comment, enter a name in the OpenID option. Are there any apps that could benefit writers? I have two that I want to tell you about. Through high school and college, I had to write the pesky "Why I Write" essay or the peskier "How I Started And Keep Writing and Why I Should Be a Writing Major" essay. I've been vaguely thinking about digging out one of those old college entrance essays. I'm curious to read what I wrote back then. I thought I was serious about my writing then, but I feel like it was playtime compared to now. Yesterday and today were more research days rather than writing days. And no, "research" is not a euphemism for "Internet stalking." Really. That's another good thing about revision; in addition to taking care of the actual writing, there is a chance to explore more research. I was redoing Chapter Two last night--I decided to bring up a scene that was on page 88 of my first draft to the second chapter. Basically, Mady and Alex are in the garden of the square they live in while in Bristol with their nursemaid when a man comes up to them and demands that they leave. It works better toward the front of the story--sets up conflict. I don't normally like being read to, because I think there's a right and a wrong way to read aloud. There's also a slight cringe factor that comes into play. It's awkward listening to your own work being read out--especially if it's not really meant to be read out. It's a short story or a novel or an essay, not a monologue. 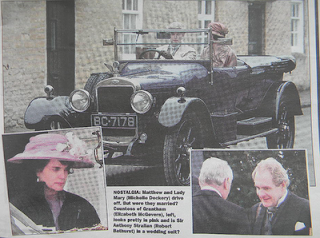 New photos from the set of Downton Abbey, which is filming its third season now. I wonder whether Matthew and Mary's impending wedding will go off without a hitch? 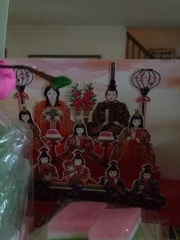 Today is Hinamatsuri or Japanese doll festival or Girls' Day. In houses with girls--and space--a platform, covered in red cloth, is displayed with neat rows of dolls and objects. And of course, there's a song.